Isaiah Quintabe is IQ, a super smart high school drop-out loner who now uses his considerable abilities for good. 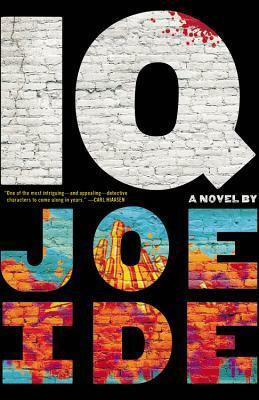 Part Sherlock, part Robin Hood, IQ leads readers on a rip-roaring ride through the streets of LA amid gangs and drugs and rappers. The main case involves IQ and his dubious friend Dodson trying to find who is trying to kill the super famous rapper Black the Knife aka Calvin Wright. But the book also takes us back in time to when Isaiah was younger. The dual narratives really drive this tale, giving the book added depth and making it more than just your regular crime drama. Ide creates an LA that you can smell and almost taste, really grounding the characters and action. Isaiah is not some privileged white boy either; he’s worked hard for what he has and is determined to use his skills to help others. Central to the story is IQ’s struggle to come to terms with his past and the legacy of his older brother Marcus. Without lecturing, the book examines ideas of the consequences of our actions, and what really creates a happy and satisfied life. This is a fun read that’s difficult to put down, the multiple points of view really helping to create interesting, realistic characters. Book two in the IQ series, Righteous, is out soon and I’m keen to see what Isaiah has been up to.